I have not printer cause I’m single,55 and on a fixed income. :-(. Would it be possibe 4 me to receive some stuff via USPS? PLZ? I don’t like these ‘deals’ that Walgreen’s has—you have to come back and buy the same product a second time to use the $1.50 coupon. You’re not really saving anything unless you DO want the same item within a short amount of time. oh, really? All their Register Rewards aren’t like that, are they? Thermoglass, I take all of my purchases to the counter and make 2 orders. The second order I use all my RR. . Anyone can do this… that way you won’t forget to use your before they expire and or worry about losing your RR receipt. 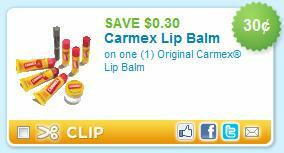 This coupon is for the original carmex, the sale at Walgreens is for the Lime or Vanilla. These people really give you a hard time when all you’re doing is helping people… sheesh! no, just trying to verify and sort things out,,,I don’t think anyone is giving anyone a hard time. There were some coupons awhile back from the Carmex website that were for the new Lime and Vanilla ones, and they were of higher value! And per the RR question, a RR can be used to purchase ANY item in the store except a few not accepted like maybe dairy or alcohol.